Correlation is simple different securities moving in tandem. 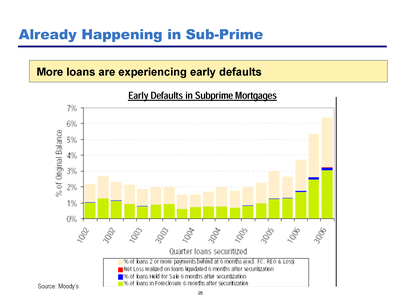 Some believe that the payors of subprime mortgages will behave differently than payors of prime and alt-a. 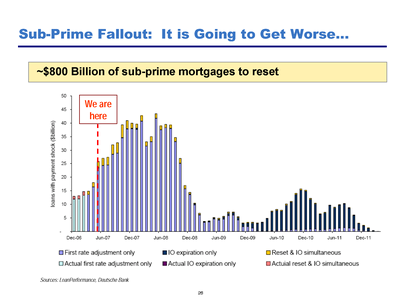 The reality is they are nearly all subprime underwritten (not my money standards by the banks that could sell off the risk instead of remaining responsible for it), thus many more of the mortgages are going to behave similarly than the ratings agencies have modeled. Hence, all of the performance surprises that we are seeing, although I was not very surprised at all. Garbage in, garbage out. 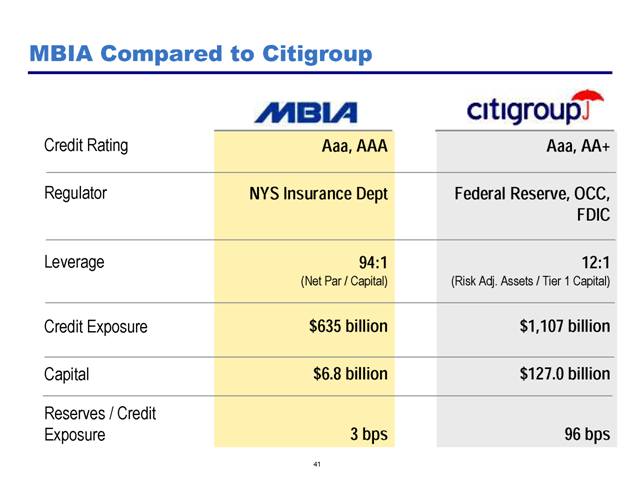 Like I said in the MBIA post above, Fitch is by far, now, the most aggressive of the agencies. Fitch said it has downgraded 37.2 bln usd of structured finance collateralized debt obligations (SF CDOs) across 84 tranches. Ratings on 66 US cash and hybrid SF CDOs remain on negative watch pending resolution on or before Nov 21, 2007.
props for the work you are doing here. Excellent and detailed stuff. Mish and CR need to see this. Superb, eye-opening work even to one who has been on high alert on the credit craze for well over a year (going back several years graphs of growth in debt/GDP were enough to scare me into gold years ago). Eric Sprott at www.sprott.com in Canada well worth reading over the past three years and currently for a general view on this debacle. Thanks for sharing this insightful work. Found your Blog Today. Excellent!!! While I honestly hate to see this mess unfolding, it's refreshing to see I'm not alone in attempting to understand it and do what I can to inform others and protect what can be protected. Thank you for the encouraging words Jack and Patrick. I will investigate the sprott site. Did you see accrued interest's newest piece on ABK? He makes a respectable case for their survival. just discovered your blog, you are doing an excellent job. I'd like to thank you for putting this together, it really was a great read. 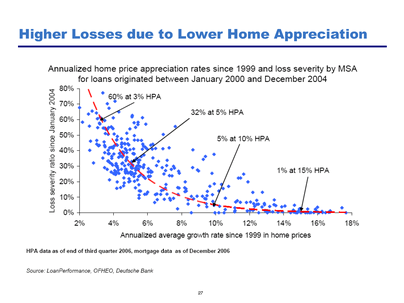 I would also like to address that mortgages are a very small part of this, the cusp if you will. While there is more pain and gnashing of teeth to be endured in the REIT's and Financial sectors I think that it is shedding some light on how wall street been tinkering with ethical practices. What other sectors have been sewn with these seeds? Or have become dependent upon the fruits of the corrupt lending? As a direct result I am watching retailers and service industries take more and more hits as money evaporates when it is applied to a housing payment. Credit is drying up extremely quickly and a sinking dollar coupled with rising commodity prices will slowly hit wallets of individuals and businesses alike. Thanks for the encouraging words. It looks like it is going to get pretty ugly. In my next big post, you will see how much damage can legally be put off balance sheet. One of the largest homebuilders in the country is effectively insolvent, and it appears that nobody notices! Amazing. Even more amazing is that their share price is being driven up significantly, on a regular basis. I will also followup with additional monolines ABK, and RDN, another homebuider or two, then move on to the next major sector to fall as well as I-bank failure and real estate abroad. I had my eye on this "next sector" since last year, but dragged my feet. Now I see it is starting to get some media exposure, so I need to solidify my short positions and research before it gets too popular. I will publish summaries of all of my research on the blog. 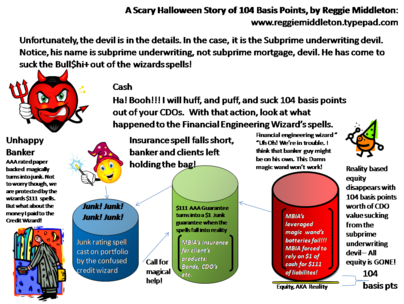 How did you get the 104 bps figure? When you say that's the spread, what is the base interest rate? 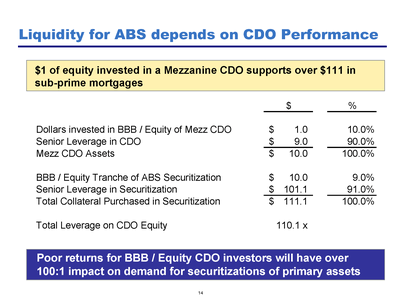 Is it the CDO rate above the US treasury rate? What's the definition of spread here? I read some of it and it looks like good, thoughtful work. I had one of my anaysts go over his work from a valuation perspective and will post the results in a day or two. We calculated the spread as the delta or difference between the underlyings issuance at par and the current market value. Actually, since my analysts were verifying the work of Mr. Ackman, they were calculating the additional spread (from his work) from the date of their analysis, which should explain why they came up with a different number than Mr. Ackman. 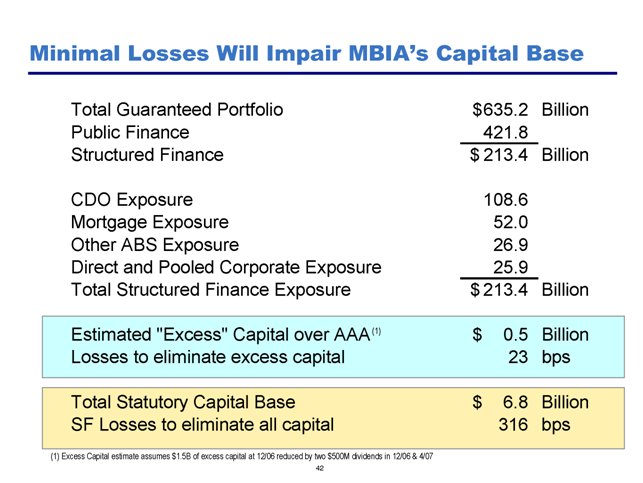 There are some assumptions made here, or course, since we do not have access to the portfolio of MBIA on a granular basis (unlike that of ABK, who has come clean on their website, and I believe that honesty has helped their cause). Thus, we were forced to lump tranches, vintages, etc. together - different packaging will probably have different sensitivities to the losses of the underlying. 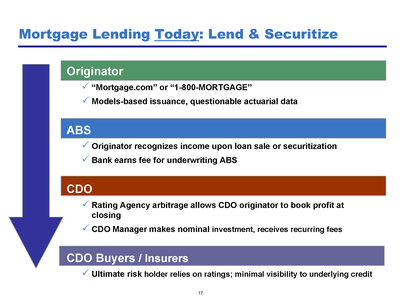 Freddie Mac's net loss for the third quarter more than doubled to $2.03 billion on higher credit-loss provisions and the marking to market of securities, reflecting housing-market weakness and the deterioration of mortgage credit. The home-loan investor said the fair market value of its net assets fell by $8.1 billion in the quarter. Freddie Mac has hired an adviser to study capital-raising options and said it is considering cutting its dividend by half. The shares fell 6% in premarket trading. "One of the largest homebuilders in the country is effectively insolvent, and it appears that nobody notices! Amazing. Even more amazing is that their share price is being driven up significantly, on a regular basis." Reggie, you have me stumped. All the home builders' stocks are in the toilet. I don't one being driven up. Any other clues? Anyway, awesome blog -- aside from not telling who you're talking about (lol). The mystery has been revealed in the recent Voodoo post. 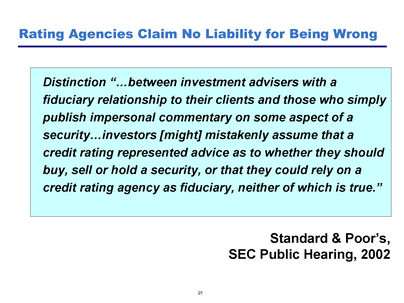 Not sure I completely agree that the credit insurers will face liabilities far in excess of their claims paying resources, but cannot argue that they are extremely leveraged. 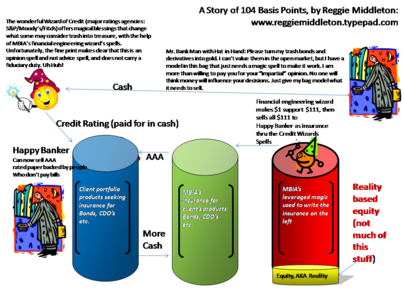 Some will probably raise enough capital to maintain AAA ratings, but a number will probably be downgraded and forced to curtail their business or go into run-off. 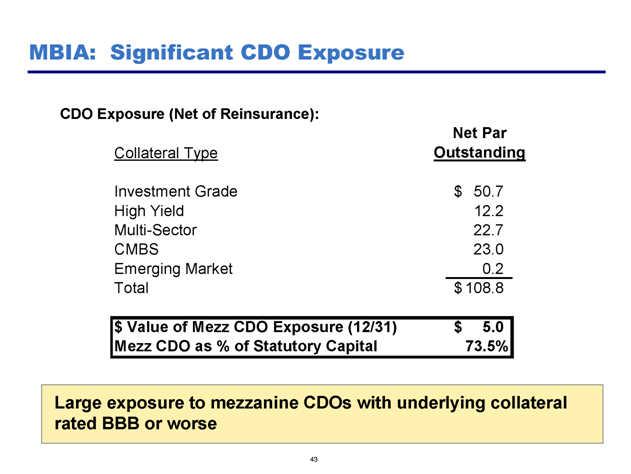 Regardless, the doomsday analyses appear to ignore credit derivative exposures, which could result in losses being recognized more quickly than insured obligations (as in the case of ACA). Is this correct or am I missing something? The issue is their leverage leads them to potential claims that are in excess of their statutory capital. I think the media and the market are putting much too much emphasis on the AAA rating as being karma in relation to claims paying ability. Look at how wrong the ratings agencies have been to date. How much more of a beating do we need before we get the point? 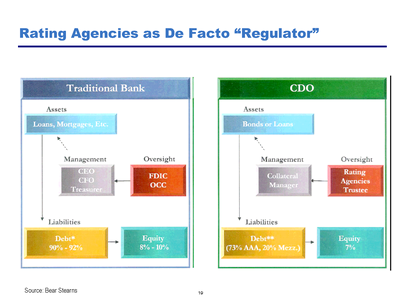 Yes, you are right about about the credit derivatives, but the companies must reserve for those losses in some instances which are charged against capital. These losses are coming in much faster and higher than anticipated. That is how I understand it.